Lift Weights Faster 1 & 2 both include a User Manual, Workout Library, Exercise Glossary, Gear Guide, Exercise Video Library, and the No Assembly Required 12-week program calendars that explain how to use Lift Weights Faster as a stand-alone program with minimal equipment, as a stand-alone with a full gym, and how to combine it with a strength program. Lift Weights Faster 1 includes 130 workouts, while Lift Weights Faster 2 includes 180 workouts. Lift Weights Faster Daily is a monthly subscription service that delivers one of over 700 workouts (including all of LWF 1 & 2) to your email inbox according to the preferences you choose, on the days you choose. Each workout includes photos and descriptions for every exercise included in the workout. Nothing to look up, no choices to make. Just open your email, and do your workout! Lift Weights Faster can be used as workout finishers to add-on to a full training program, or as a stand-alone workout. No matter how you use the Lift Weights Faster workouts, just a few short workouts a week can make you fitter than ever. Not everybody is ready for, needs, or even wants to go the traditional training route of a comprehensive strength training program combined with traditional cardio for hours per week. If you're lucky, you might have 10-30 minutes you can spare a few times a week and you need to get the most bang for your buck. Boring is deadly. Boring is noncompliance. Boring is failure. If you dread your workouts, it's time to try something new. The Lift Weights Faster conditioning libraries include hundreds of different workouts, so you have plenty of variety and choice. Even better, you will want to do them because they're designed to be fun. The workouts are incredibly short — just 10 to 30 minutes! — yet still pack a punch. You don't have to block out hours in your calendar (which can be so daunting that it leads to skipping them altogether! ), which will save you massive amounts of time. Most traditional programs neglect both major and minor muscle groups, and leave your body with strength gaps that leave you more susceptible to injury. Lift Weights Faster will increase and balance your strength in every direction! With Lift Weights Faster Daily you can get your workouts &emdash; customized to your preferences &emdash; delivered right to your email with all the instructions and exercise descriptions included. It's a huge time and brainpower saver! You’ve got three great options, all of which smoke you through a combination of carefully crafted full-body circuit workouts. You can pick one of the two Lift Weights Faster workout libraries for a choose-your-own-adventure-style fitness plan. Lift Weights Faster 1 & 2 contain 130 and 180 unique workouts, respectively. Or, if you'd rather set your preferences just once and have things hand-delivered to you, you can choose Lift Weights Faster Daily where you'll receive workouts in your email inbox on the days you choose, according to the preferences you set. What's more, you can change your settings any time you like, such as switching to minimal workouts when you know you've got travel coming up. No matter which version of Lift Weights Faster people choose, we’ve received hundreds of emails from satisfied sweaters saying they can’t believe how much value they get for the money. How you can dramatically shorten your training sessions and still get super fit. Lift Weights Faster: User Manual ($99 Value) I’ll explain the how to get the best results possible (as well as cover the biggest conditioning mistakes). You’ll also learn how to use these workouts with a traditional strength program, if you choose. Lift Weights Faster: Conditioning Workout Library ($199 Value) The Lift Weights Faster conditioning libraries each include 130 and 180 done-for-you workouts, respectively in volumes 1 and 2, each with in-depth instructions, as well as sections broken down easily by equipment and expected workout times. Lift Weights Faster: Gear Guide ($99 Value) If you’re looking to pick up some equipment of your own, figuring out where to start can be challenging. My gear guide cuts through the fluff with solid recos. Lift Weights Faster.com: Exercise Video Library ($199 Value) Instant Access! For those who like to be talked through things live, I break down 30 of the most complicated exercises to help you perfect form, avoid injury and improve the way you move. PLUS a dynamic warm-up and five challenge workouts! Lift Weights Faster: No Assembly Required ($199 Value) PLUS, included are FOUR comprehensive 12-week programs that explain how to use Lift Weights Faster as a stand-alone program with minimal equipment, as a stand-alone with a full gym, plus how to combine it with a strength program with either set-up. On the other hand, if you just want to be able to open your email and have every single thing laid out for you at your fingertips, Lift Weights Faster Daily is the choice for you. When you sign up we'll ask you a few simple questions such as what type of workouts you want, how long you want them to be, and what your experience level is. Then we'll send you a workout tailored to your preferences that includes a dynamic warm-up, the workout itself and any instructions, plus pictures and descriptions of every exercise in the workout. The Lift Weights Faster Daily library includes every workout from Lift Weights Faster 1 & 2 plus an additional 350 workouts, so you'll get plenty of variety! Nothing to look up, no choices to make. Just open your email, do your workout! One of the best moments for me was when I was teaching my daughter to ride a bike, and I could run alongside her effortlessly for as long as she needed. I couldn’t do that before Lift Weights Faster. The Lift Weights Faster workouts are FANTASTIC! I am a true kettlebell and lifting enthusiast and Jen brings a new fresh approach with her great ability to convey good form and instruction. The workouts are new and challenging and that makes it fun! I have learned more about good form and maximizing my training time with the help of Lift Weights Faster. One of the best instructors EVER — just listen to her clear instructions and cues in her videos! I like the precision in her method. Can’t even begin to tell you how much I love it! These workouts are challenging, effective, efficient and FUN. I genuinely look forward to every workout and my progress. I don’t want to have to join a gym – do I have to? You do NOT need a gym membership to do many of the workouts included in Lift Weights Faster. The 10-, 20-, and 30-minute workouts don’t seem like they would be sufficient. Would Lift Weights Faster need to be supplemented with another workout program? You’d be surprised what kind of changes you can effect in that amount of time! If you’re doing the workouts correctly, with proper form and steadily increased weight over time, and completing them more quickly, you’ll continue to give your body reason to adapt. "Which version should I get, the original Lift Weights Faster or Lift Weights Faster 2?" Honestly, you can’t go wrong either way. The workouts are all new and completely separate from each other, and both resources are rich with video instructionals, high-definition photographs, and written descriptions of every single exercise that appears in any workout. Is Lift Weights Faster a program or a collection of workouts? Should I do them in any particular order? 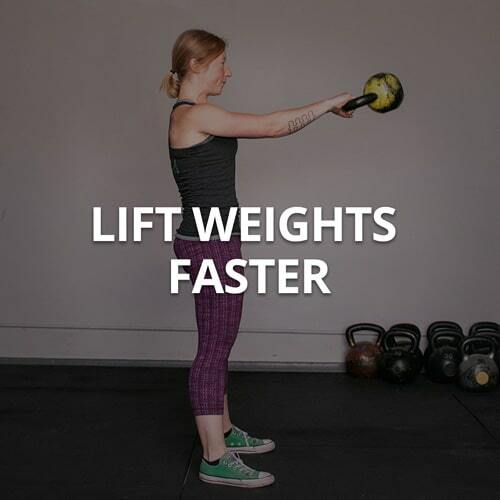 Lift Weights Faster is a collection of full-body, strength-building, fat-burning workouts. You can do any of them in any order, OR you can use the workout calendars provided in No Assembly Required, and follow the plan as mapped out for you. Just keep in mind that, as my friend Carla Birnberg writes, It doesn’t MATTER what the ‘ideal’ is. What matters is what I will consistently do. And I can promise you that you will do these workouts, which have all been tested on clients and other trainers, because you will love them. I travel a lot for work. Will Lift Weights Faster be an effective workout for when I’m jet-setting from place to place? If you travel a lot, it’s not feasible to only train when you’re at home — I hear you loud and clear on that one! This conditioning library is the perfect thing to take with you on the go. Because the workouts are organized both by equipment and time, you can select the ones that are appropriate for you in any environment (and there are lots of options for limited equipment and space!). Even if you’re limited on time and equipment, there are plenty of ways to keep your workouts fresh and challenging. Lift Weights Faster workouts include varying set and rep schemes, and diff),rent rest styles and workout structures, so cycle through different workouts to always present your body with a challenge. Who is Lift Weights Faster for? Lift Weights Faster is for anyone looking to enjoy their trip to the gym, their backyard or their living room. Lack of motivation doesn’t discriminate by gender, and neither do I. By enjoying your workout, you’re more likely to stick with the program and continue outdoing your expectations, whether man or woman. With our library of exercises, videos, workouts and how-to’s, anyone can learn these the movements included in these workouts. If you’re already),familiar, that’s great. If not, get ready to learn exercises and movements you’ll remember and use for the rest of your life! Am I too old to do such fast-paced workouts? At the gym I co-own, The Movement Minneapolis, I run classes with people anywhere from age 21 to 66, and we do Lift Weights Faster with them three times a week. I don’t believe limits should be placed on participants because of their age. As we age, fat-burning hormones like growth hormone and testosterone begin to decline, so a program intended to spik), these hormones, as Lift Weights Faster workouts do, can only benefit you in the long run, either young or old. Everything Lift Weights Faster provides for you is meant to be learned by anyone who is interested. That being said, if you’re already a fitness enthusiast, this program is),perfect for you, as well. The workouts are intended to challenge each participant — and that looks different for everyone. Done, deal, I’m in! How will Lift Weights Faster be shipped to me?? Shipping is so 1999. All programs are completely digital. Lift Weights Faster 1 & 2 are a downloadable series of PDFs that you get instant access to as soon as you purchase. Lift Weights Faster Daily is a subscription service that will be delivered right to your email. What’s more, you can download & access the entire system on any device that can read a PDF — which these days is nearly anything. You can read it on your computer, your tablet, or your phone, provided it doesn’t take up the entire passenger seat of your car. You can even print it out. Be forewarned — it's about 9" tall of printed paper.